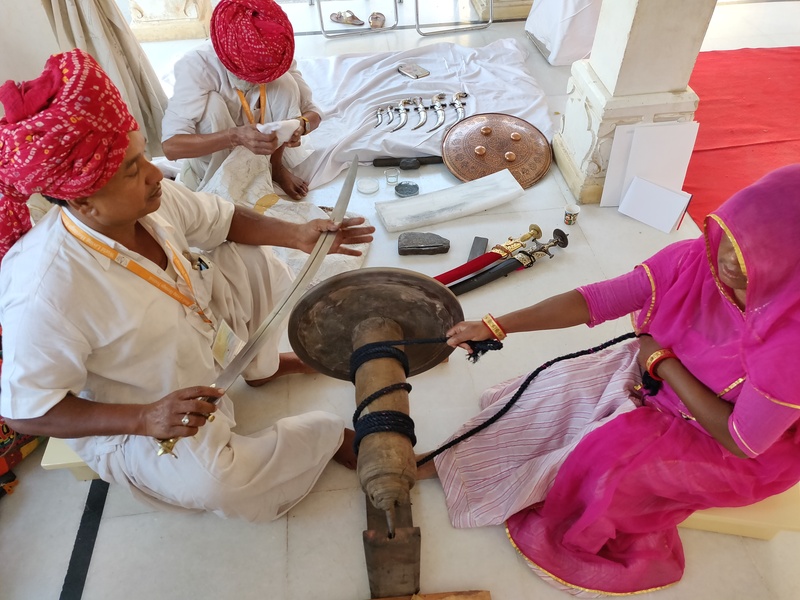 To meet one of the only families of Sikligars or Swordsmiths of Rajasthan in Udaipur who continue to practice the traditional way of working with swords is an eye opener in more ways than one. For the swordsmiths like Heeralal, the swords mean everything to them and rightly so. “The sword is like my soul I cannot leave what I do. I do not worry whether I can make money or not. The sword is a part of me and I value it far too much to let it go.” In fact the swords are prayed to and celebrated during the annual nine day Navratri festivities when they are worshipped by placing them in front of the idol of the Goddess and are believed to gain magical powers. “They consider these objects entirely differently as spiritually charged ritual objects rather than just a sword. They believe in the importance of the power within the object rather than its external form,” explains Singh who has experienced these rituals first hand. After nine days, the sword is removed and taken out on a procession in the village and there is a big celebration. As part of the festivities, the villagers dance with the sword and some also hit themselves with the sword as an act of asking to be pardoned for their past misgivings. The swords are revered and are seen as a way of experiencing the healing energy of Goddess and a way to connect with the higher being. In fact they also keep the sword below the head of pregnant women when they sleep as they believe this will ward off evil spirits. 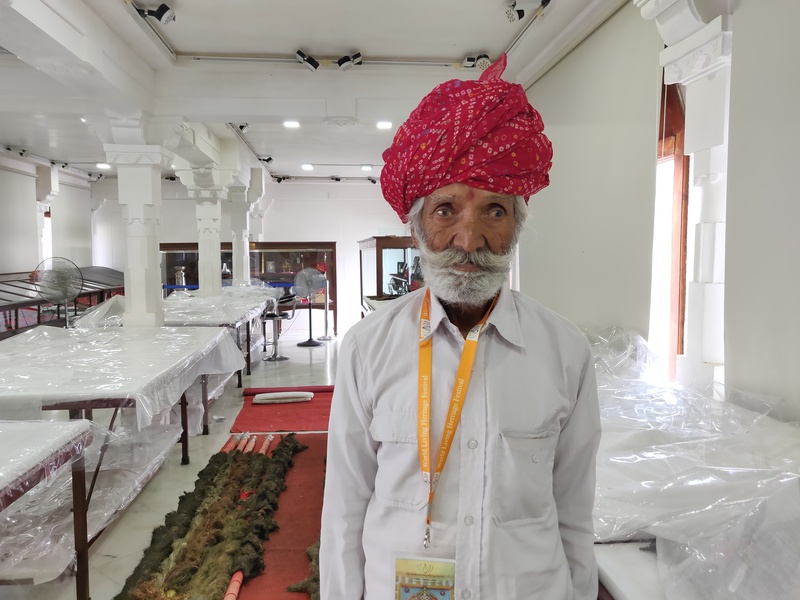 Traditional conservation techniques are part of the Arm and Armours project at the City Palace, Udaipur and Shriji Arvind Singh Mewar of Udaipur, the 76th custodian of the House of Mewar is overseeing the effort. Singh and her team are working on cleaning, conserving and restoring as well as documenting the weapons at the armoury here. Singh and her team are merging traditional smithing with advance nano materials to restore and repair swords. Use of advance nano crystalline materials like alumina powder and silicon carbide powder and synthesis of new composite material from traditional adhesives has helped in this process. “Carbon Fibres and Carbon Nanotubes have been used as the reinforced materials and pure lac is used as a matrix material. These are nontoxic and biodegradable in nature and open up new potentialities in order to use them in other fields of art conservation and other scientific applications too,” avers Singh. However with most things traditional, the challenge is that the lack of demand for swords has meant that Sikligars have changed their business to making scissors. 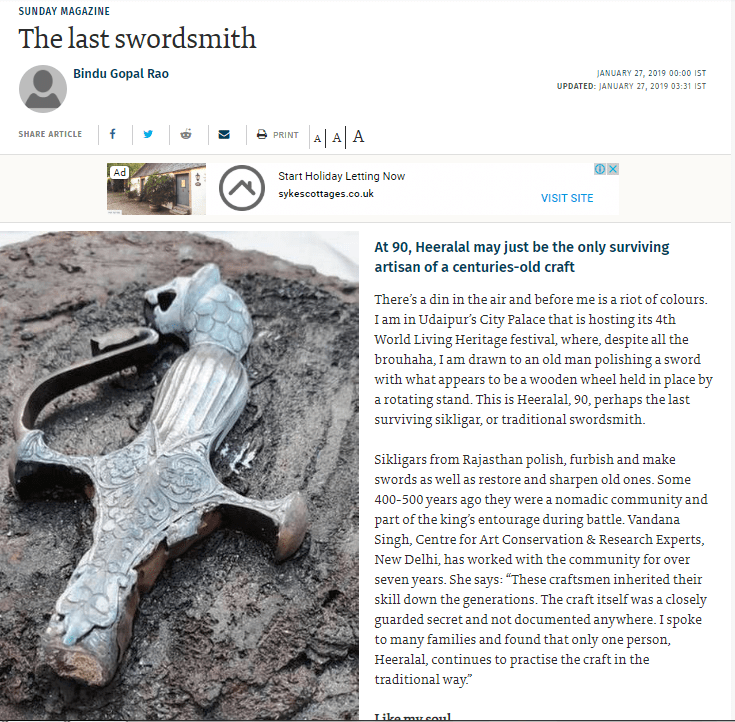 However all is not lost as Singh and her team has started documenting this dying art by interviewing the remaining traditional swordsmiths and also organise live demonstrations to rekindle the art. Slowly but surely the Sikligars are being recognized in many forums that has restored the pride in the craft and seems like there is hope for the Sikligars, after all.